Photos Companion will make file transfers easy. Microsoft plans to make it easier to transfer photos from iOS and Android devices to a Windows PC. Its upcoming Photos Companion app will make the process effortless, without the need for a cable. It has never been particularly easy to import your photos from an iPhone or iPad to a Windows PC. It’s possible, but the process is messy and cumbersome. And with traditional USB ports dying out in favor of USB-C, it’s becoming even more difficult. Microsoft hopes to change that. Windows 10 testers will soon have access to a new photo transfer feature. It will work alongside a Photos Companion app for Android and iOS to make photo and video transfers quick and simple. You’ll presented with a QR code on your PC, which you’ll scan with your smartphone or tablet. You’ll then select which photos you want to transfer, and they’ll be uploaded wirelessly (provided both devices are on the same Wi-Fi network). Microsoft offers a similar feature in OneDrive. It lets you backup your photos and videos to the cloud automatically, and then access them on your desktop by signing into the same account. It’s identical to the camera upload feature offered by Dropbox. But not everyone wants to use OneDrive, or send their data to the cloud, or pay for extra cloud storage. 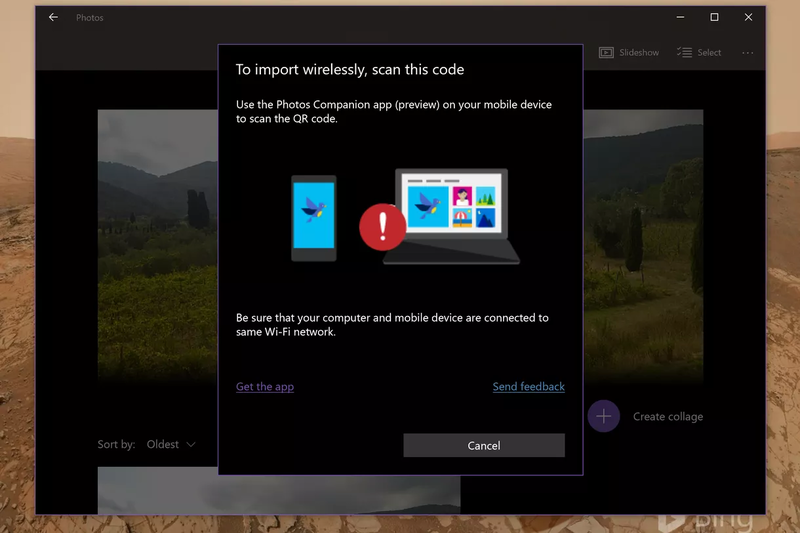 It’s not yet clear when the new Windows 10 tool will be available to everyone — that will likely depending on how the testing process plays out.